In December, 1984, a wonderful group of neighbors living in West Allis, Wisconsin, joined together to collect donations for the MACC Fund – Midwest Athletes Against Childhood Cancer, Inc., in honor of a neighbor's child diagnosed with cancer. 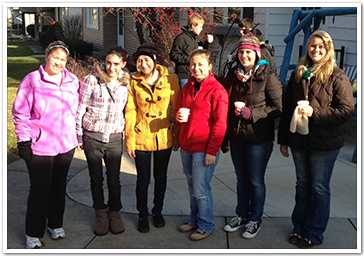 The neighbors worked in concert in decorating their homes and encouraged visitors to make a small donation as they drove through the festively enhanced neighborhood. All of the money raised went to supporting research, treatment, and the eventual discovery of a cure for childhood cancers and related blood diseases. Wow has it grown! Since its inception, the neighborhood program has raised more than $2.2 million. More than $121,000 was raised last year alone! Visitors come from far and away to drive or stroll through this winter wonderland of holiday sights and sounds. 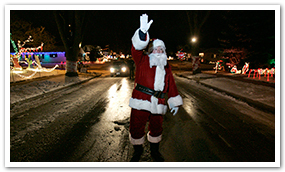 Candy Cane Lane is in West Allis, Wisconsin, from Montana Avenue on the north to Oklahoma Avenue on the south, and from 96th Street on the west, to 92nd Street on the east. To get driving directions, just visit our Directions page. 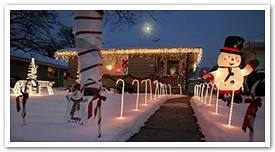 Candy Cane Lane is festively decorated houses and trees wrapped like candy canes. 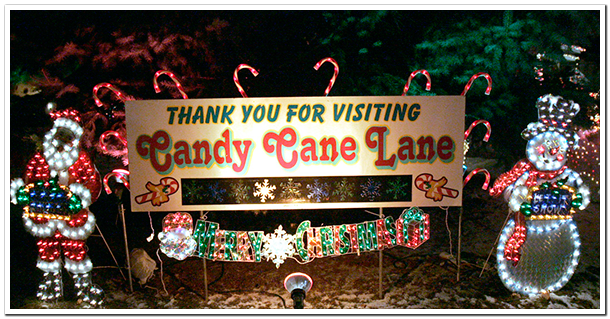 Over the years, Candy Cane Lane has raised over 2.2 million dollars for the MACC Fund! You never know who you'll meet at Candy Cane Lane! You Know It's Candy Cane Lane Time When You See The Wrapping On The Trees! 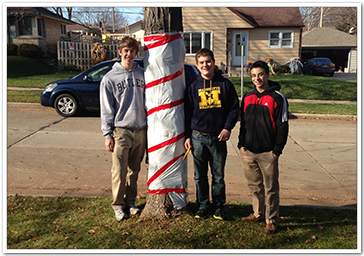 Each year, just before Thanksgiving, local students volunteer to give the trees in the Candy Cane Lane neighborhood their red and white candy cane wrapping. 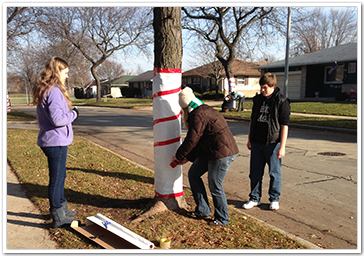 Students from Nathan Hale High School transform ordinary trees into candy canes! West Allis Central High School students on hand to wrap trees. 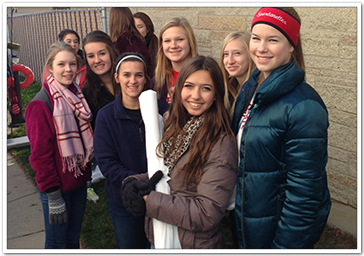 Brookfield East High School students ready to wrap. Mission Accomplished! by Marquette High School students.